An original "Black Power" OSPAAAL (Organization in Solidarity with the People of Africa, Asia and Latin America" poster. Many OSPAAAL posters, this example included, routinely printed their message in English, Spanish, French, and Arabic. 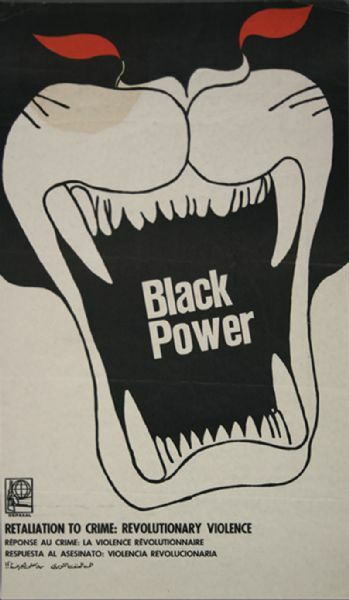 Founded in 1966, it is likely this poster was printed during the early years of the organization's existence, since use of the term "black power" first became widely popularized during the late 1960's. Though the wildcat or panther figures prominently in the poster art, it is most likely not a reference to the American Black Panther Party. Measures 13 x 22, several horizontal folds, moderate wrinkling with some staining.